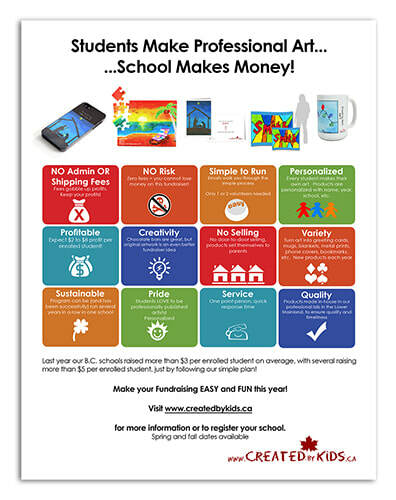 Thank you for making Created By Kids Western Canada's fastest growing school art fundraiser! Kids Create Professional Art - School Makes Money! Low maintenance and administration for the PAC, with high margins (50% to 67% profit percentage on all items). We know you are volunteering your time so we make it as simple as possible for you. A local Lower Mainland, B.C. company, ready to work with you personally on this fundraising project to help you succeed. With this program, every student in the school has an opportunity to make an art masterpiece on special card stock paper (provided to you at no charge). If this program is run in the fall, Christmas themed art works great, though Generic art can also be created. If this program is run in the spring time, generic images work best as they can then be used for Birthday Cards, Thank You Cards, Just Because Cards, etc. Once the child has completed their art masterpiece, the parents/guardians then have the option of purchasing beautiful, professionally printed 5x7 folded greeting cards, coffee mugs, iPhone covers, bookmarks, calendars, metal and canvas prints, and puzzles featuring their child's art! These limited edition keepsakes, which are also personalized with the child's name and age, are an easy sell to proud parents, and children are ecstatic to see their work in this manner. Envelopes are included with greeting cards. The cost is reasonable for the parents and the children are so excited to see their very own artwork sent out as a Greeting card or art gift. And for the school, profits add up quickly with a minimum of administration. We take care of providing all the materials and teacher instructions, and production of the cards. You collect payments and send us one cheque at the end of the fundraiser. Everybody wins! This program is designed for schools in British Columbia and Alberta specifically, but can be run across Canada. For more information on how your school PAC can run this exciting fundraising program, please fill out the form below and we will get back to you ASAP! Here is a quick information sheet you can bring to your next PAC meeting. Just click to download and print!